As I mentioned, I am not one for decorating for Christmas. Despite that, we have a shitload of Christmas items so that by the time I'm finished, it's as if Christmas spewed over the living room and dining room. 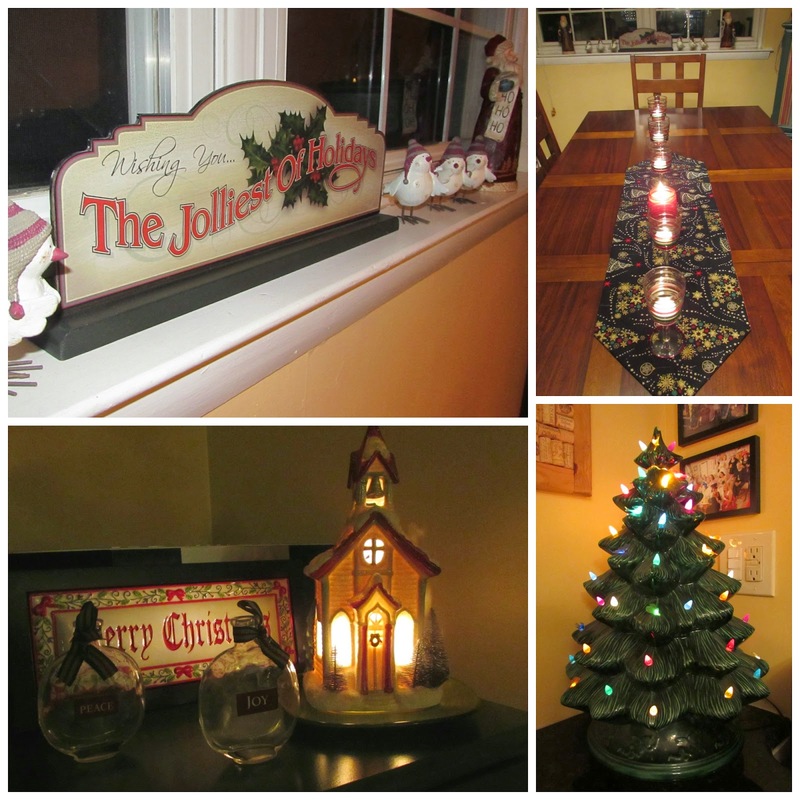 I don't decorate around things, I remove my standard stuff and replace with Christmas items. We even move a lamp and chair from the living room to make the tree stand alone. I take care of the indoor decor with the exception of the front window, and MFD takes care of the front window and the exterior. Here's some of our decor. When preparing for this post I realized I'm not good at taking photos of Christmas stuff. HO HO HO MOFOS. Living room - entry table. 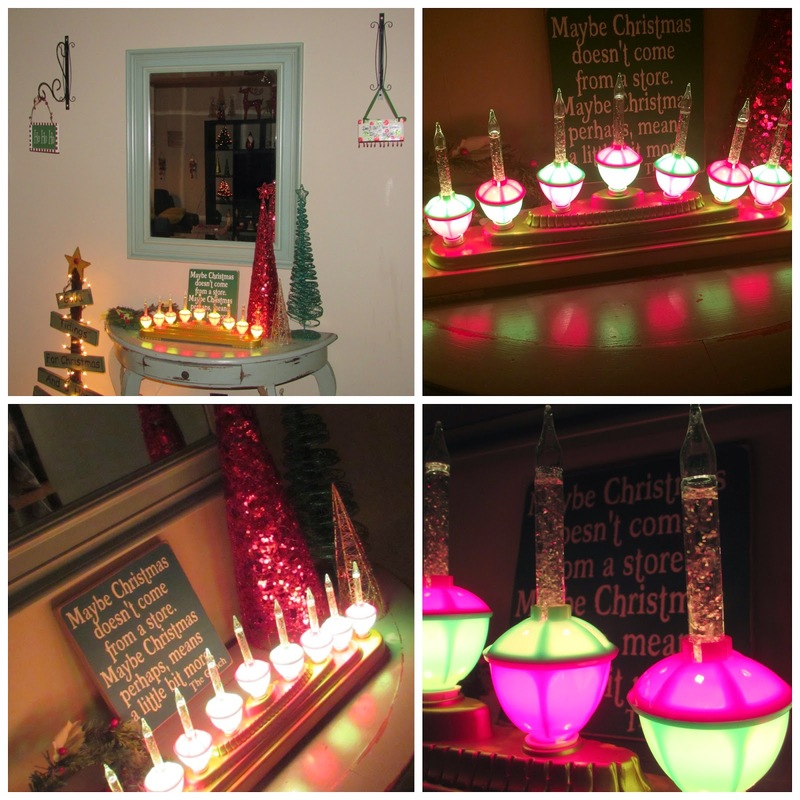 The bubble light candelabra (Vermont Country Store) and sign (gift from Lori) are new this year and I love both. Exterior - missing some wreaths and some small trees and candy canes. Ho ho no. Good tidings of comfort and joy, friends. Today we're heading from Miami to Disney and I have access to my beloved mistress Instagram again so I'll surely be blowing that up all weekend along with facebook. I've been to Disney a lot, but I've never seen it done up for Christmas. I cannot wait! Have a great weekend. I don't know what you are talking about not liking decorating because it looks gorgeous! Love all the little touches and the Grinch sign. Have fun at Disney! Fabulous pictures. Love the Vermont Store find, the Grinch sign and of course the table runner I made you. Your home looks fabulous. Disney at Christmas is probably a dream. Beautiful! 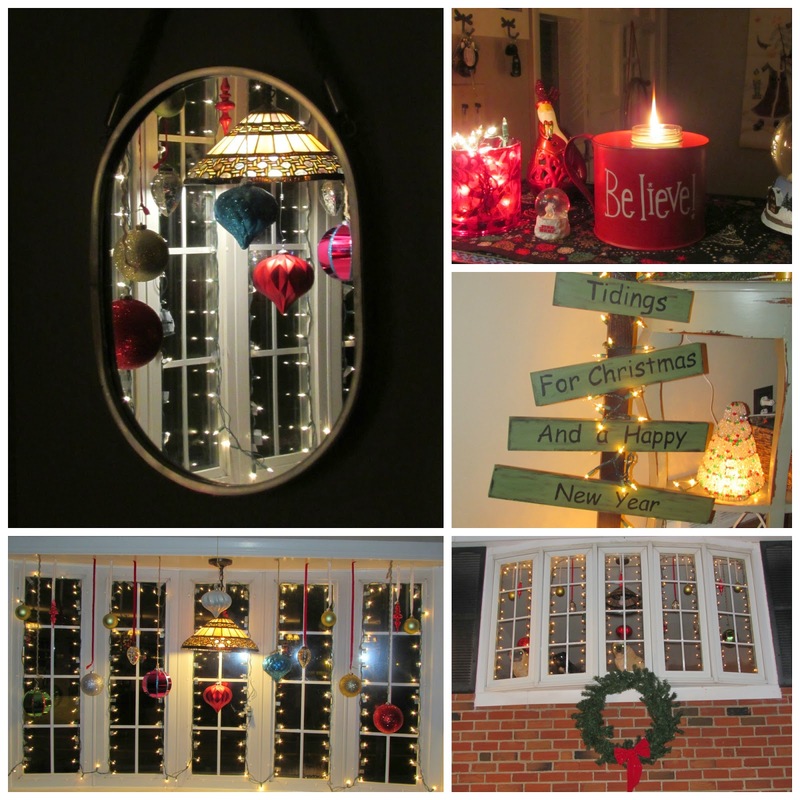 I think my favorite is the front window. I was at Disney in December oh... 29 years ago and it was so cool. I can't imagine how fabulous it is now! Yay yay yay for such pretty decor! I love it! i love all the decor; esp the grumpy dogs. every time you post pics of your pups, i laugh; their expressions are priceless! Hello, your decorating is pretty awesome for someone that doesn't like to decorate. I love what you did with your front window. Ugh, now I need to up my decorating game LOL. Hope you are having a wonderful vacation! Oh and Wham is the best. Whoa -- you DO have a lot of Christmas stuff! I have such a fondness for bubble lights... my grandma always had them on her tree when I was little and I thought they were so cool! Have fun on your trip! Haha awww the dogs in the window, such a good photo! I LOVE IT!!! LOVE IT LOVE IT LOVEIT! And the dogs in the window. DAWWW puppies! You have a gift, it all looks amazing and it's so well put together!! I would say hope you're enjoying your vacation, but I know you are because the pictures on instagram are amazing!! your house looks awesome!! don't tell me you don't like it when it looks 10 times better than mine! Dogs in the window!! Wonderful! So festive! I have one of those little ceramic trees too. My mom made it when I was a kid. I AM DYING over your bubble light candelabra!!! I hopped right over to the VCS website and now I'm drooling over that snowman holding the bubble light. I'm pretty much done buying decorations this year but next year...BRING ON THE BUBBLE LIGHTS. I love the front window and the tree! I took pictures of my tree before Tyson threw tinsel all over it, oh how I hate tinsel. LOL grinch dogs! 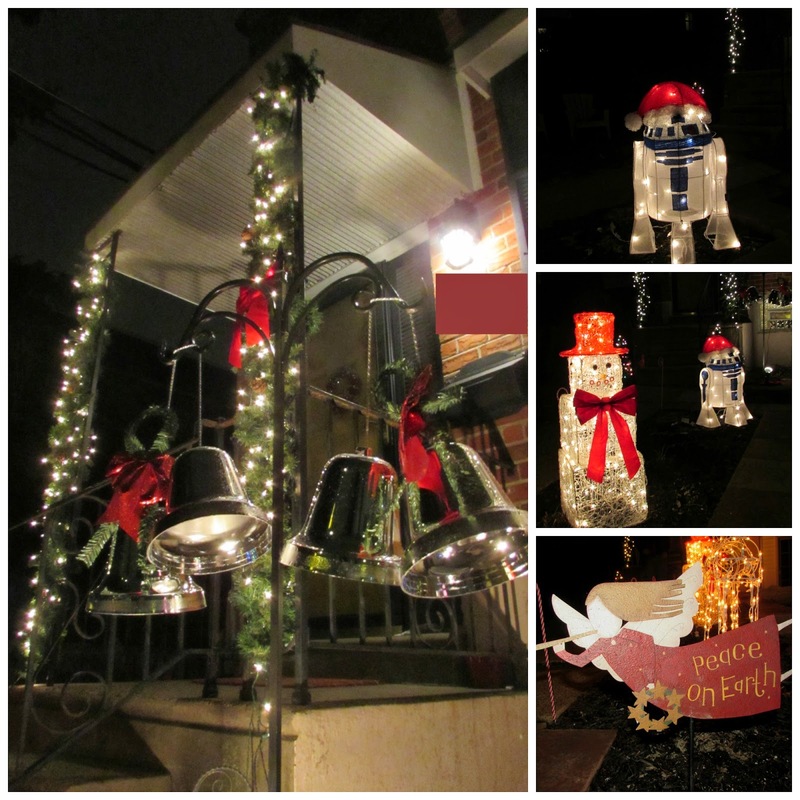 It's so festive at your house. I love it! 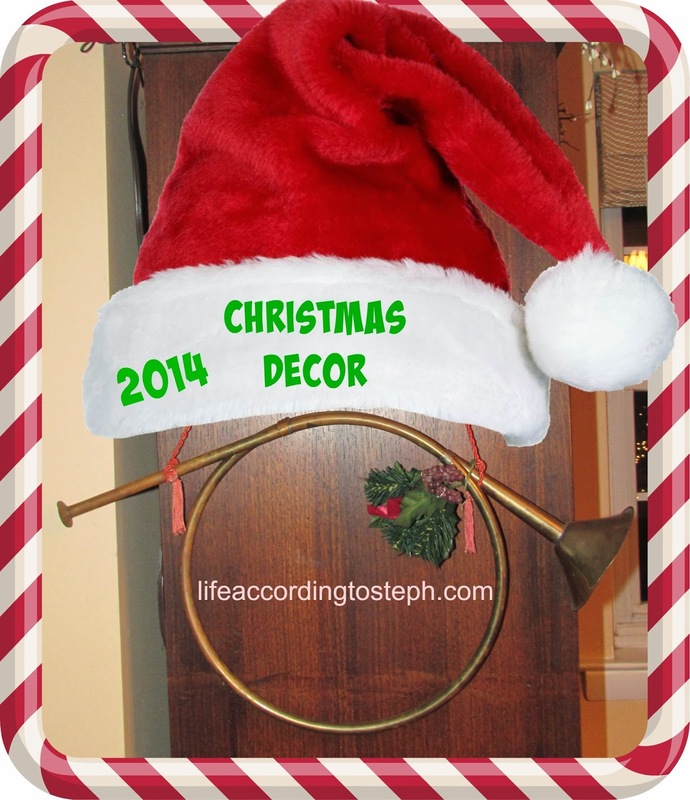 Ahh, I love all the Christmas in this post! You may not like decorating, but you do a fine job! The house looks great! 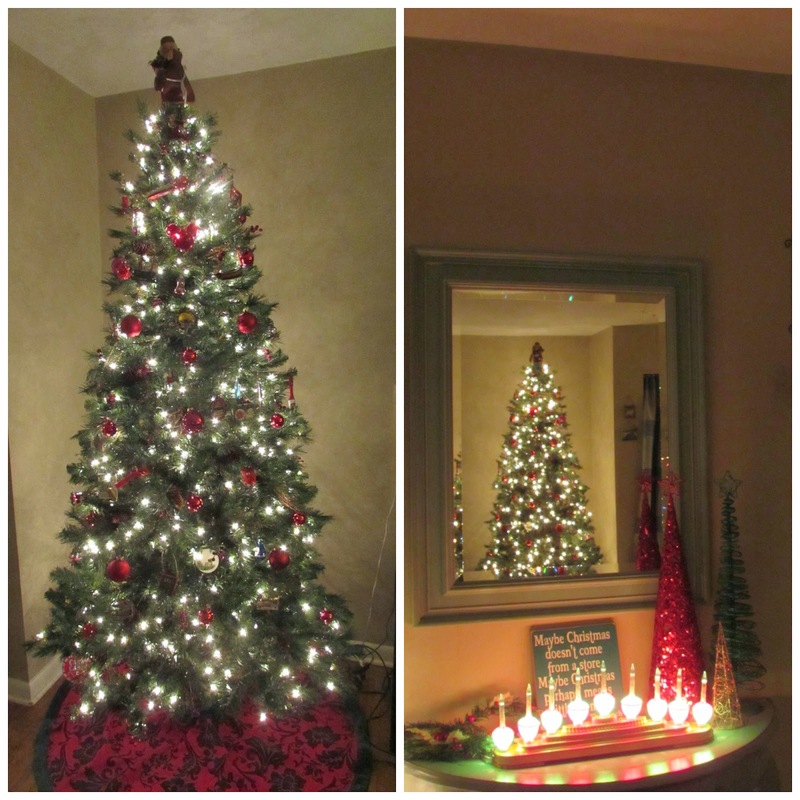 love your christmas explosion in your house! and jealous of your disney trip - i've been there at christmastime before and it's so fun! Ummm holy decorating. I thought you didnt like it?? It looks fabulous!!! I love alllllll of your decor!!!! There is so much and it is so festive! My mom painted one of those ceramic trees with the lights when I was little and it sits on her hutch in her dining room all year because "it is good luck to leave out one Christmas item year round" according to her family. You guys go all out and I love it! One day I'll bring all my decorations back out. When the kids and cats are a little older. Haha! I love your entertainment center and the huge window! Great job!